National non-profit looks to inspire young Canadians. 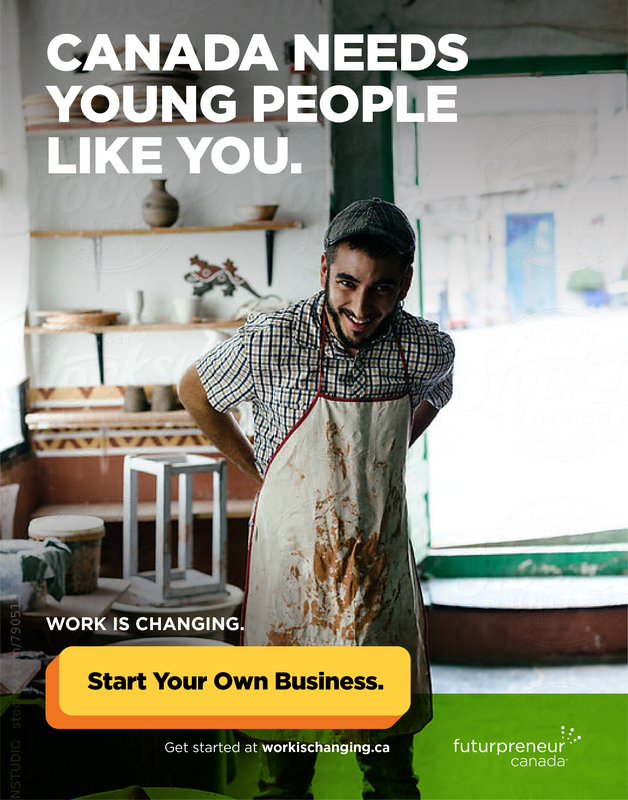 Futurpreneur Canada is a national, non-profit organization that provides financing, mentoring and support tools to aspiring business owners aged 18-39. Following a rebrand from the Canadian Youth Business Foundation to Futurpreneur Canada, the organization needed to launch a national brand campaign. Futurpreneur enlisted Brandish to develop a narrative addressing the nation's need for more young entrepreneurs and their increasing importance in our economy. To create a new narrative for Futurpreneur, we evaluated the national conversation around Canadian youth and entrepreneurship. We distilled our research into insights that formed the foundation of our work. Technology is disrupting the workforce. Young people are entering an economy that has been unpredictable for their entire lives. Waves of technological advancements are changing the labour force and disrupting the job market every day. Artificial intelligence and automation are displacing entry level jobs that historically formed the foundation for long-term careers. Not only are young people experiencing a disproportionately high rate of unemployment, but studies show they are learning skills that may be out of date for the job economy they are entering. There is nothing to replace the jobs we are losing. These growing technological trends like automation only amplify existing challenges in the Canadian job market caused by globalization. Major emerging economies are becoming more competitive in areas that the North American economy has traditionally been dominant, such as the design and manufacture of semiconductors, pharmaceuticals and information technology services. Very few organizations do a good job explaining to young people that they’re individually competing in a global marketplace. Until recently, entrepreneurship has been viewed as risky, unattainable and ultimately out of grasp for the average person. Futurpreneur actively communicates that they help reduce the risk often associated with entrepreneurship, but a new narrative needed to be applied to entrepreneurship as a whole. One that inspires young Canadians to take risks and explore the idea of what it means to be an entrepreneur. While starting your own business can be risky, a career can be as well. Despite popular belief, entrepreneurship isn’t always about seeking rewards or chasing success. Despite the majority of the conversation surrounding entrepreneurship supporting that narrative, the young entrepreneurs we spoke to told us a different story. These young Canadians didn’t think of themselves as typical ‘entrepreneurs’; instead they viewed themselves as small business owners, freelancers, or subcontractors. Their driving factors for self-sufficient career choices were based on economic necessity or a desire to for a flexible work-life balance. This reality is what some are calling ‘the gig economy’— an economic environment characterized by freelance jobs, short-term contracts, no benefits, no long-term stability and not the traditional 9-5. With 34% of the Canadian workforce now made up of freelancers (projected to be 50% by 2020), the reality is that there are a significant amount of young people already working as entrepreneurs, without realizing it. 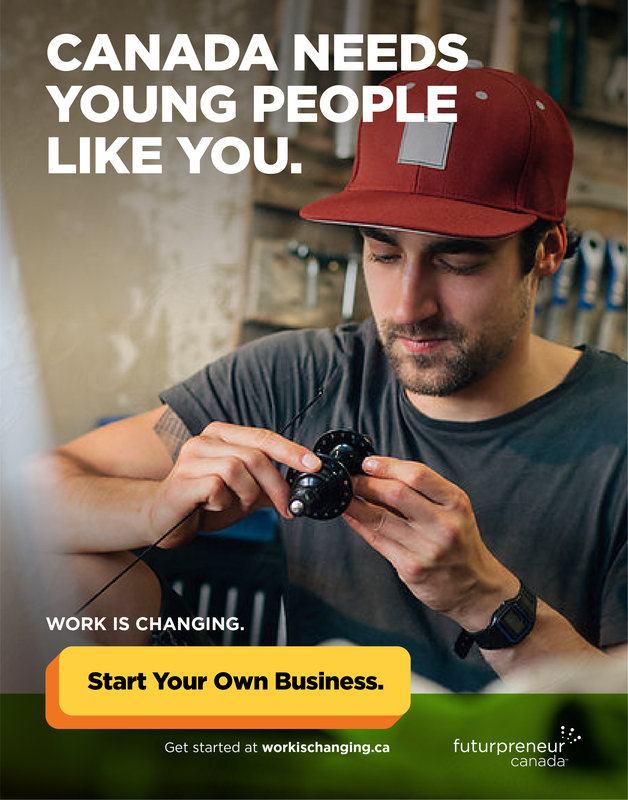 To these young people, an “entrepreneur” is Richard Branson, not a hard-working subcontractor pursuing flexibility, independence or creative control, rather than financial gain. After our research, we strongly believed that it’s dangerous to keep talking about entrepreneurs like they are unicorns. Entrepreneurs come in all different shapes and sizes and are not only about financial success or explosive growth. We knew our work had to spark a fresh and inspiring conversation that was inclusive to all entrepreneurial motivations and the realities of our changing workforce. With the goal of recontextualizing entrepreneurship and positioning it as a rising pillar of employment, we wanted to educate young Canadians on the trends of the changing job market. Our hope was that the facts associated with entrepreneurship would elicit a sense of ease and accessibility, especially when sharing the resources available to them through Futurpreneur Canada. 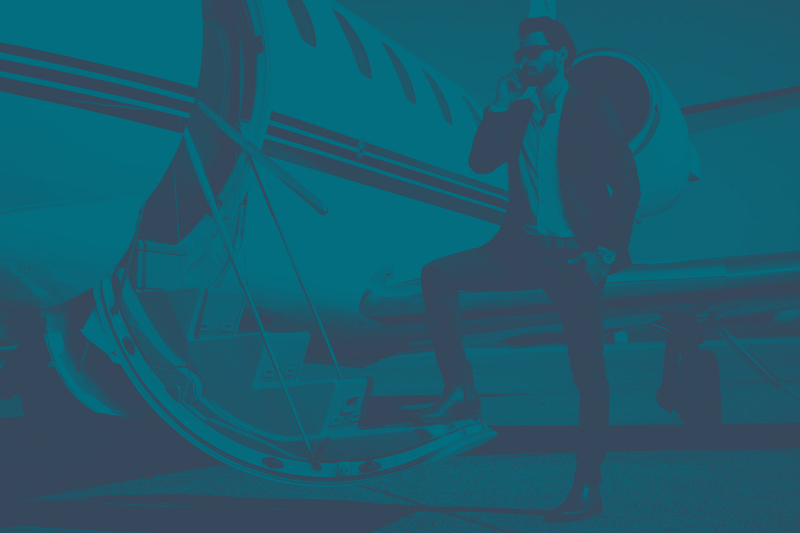 Prioritizing relevancy, our work needed to communicate that entrepreneurship is no longer the domain of an ‘elite’ group of people, but instead a viable and accessible career alternative for young people. 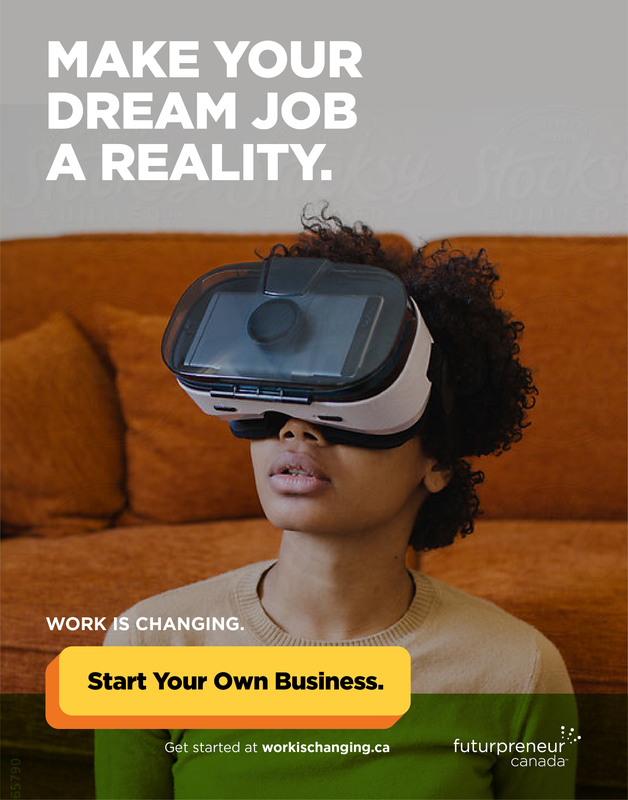 This presented an opportunity to recontextualize the futurpreneur name as well. Moving from that of ‘future entrepreneurs’ (Unicorns) to ‘our future is entrepreneurs’ (everyone). 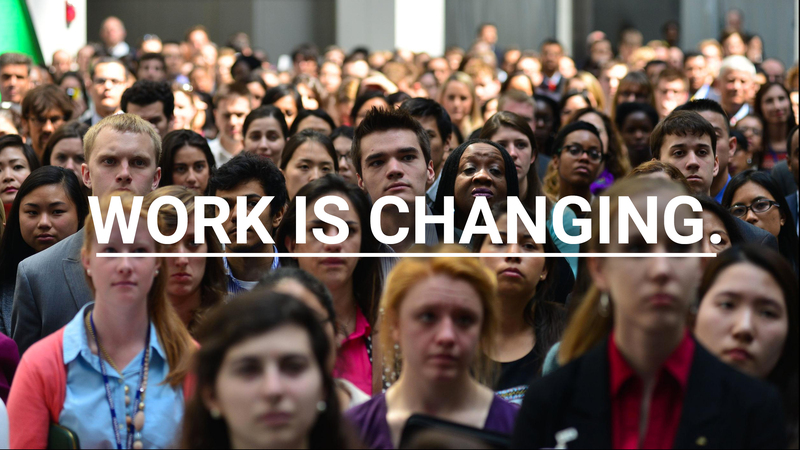 The result: Work Is Changing. This shift better aligned Futurpreneur with its core audience. It allowed us to speak directly to young people and invite conversation about how owning your own business can offset the uncertainty of a rapidly shifting economy and provide benefits a traditional job can’t. The ways in which we work are changing — profoundly and indefinitely. Old rules are being replaced with new norms, driven by technology and changes in the economy. The best way to prepare is with open and well-informed conversations around the trends causing these changes. As organizations across Canada become more involved in discussing how work is changing, Futurpreneur can help lead the conversation and ensure entrepreneurship has a strong role in the discussion. “Work Is Changing” was our core message and the foundation of our campaign. Awareness comes from building context, so we worked with Futurpreneur to research and develop five narrative themes. 5. Lack of viable job options. 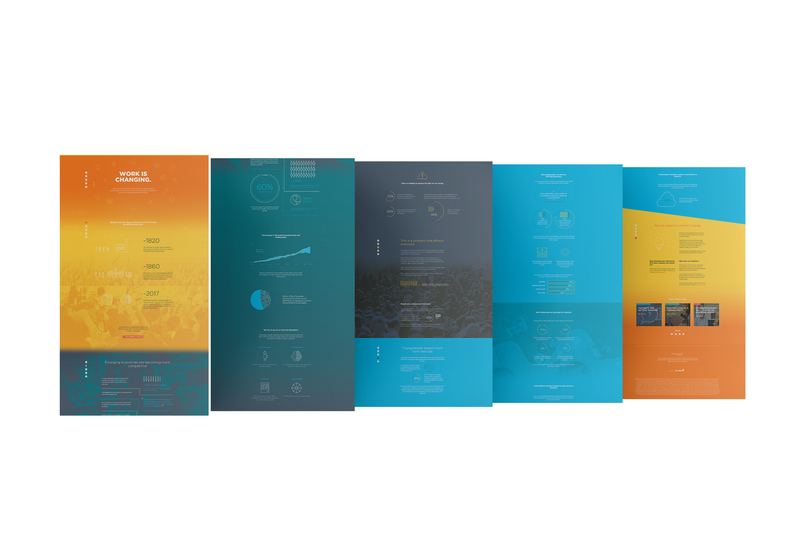 Once we developed our campaign message and accompanying themes, we built core media assets to demonstrate how the narrative themes would be represented in-market. Once our concept was developed into a multi-year campaign, we focused on creating long-term, high-value assets to be leveraged for audience education and wide-scale promotion. 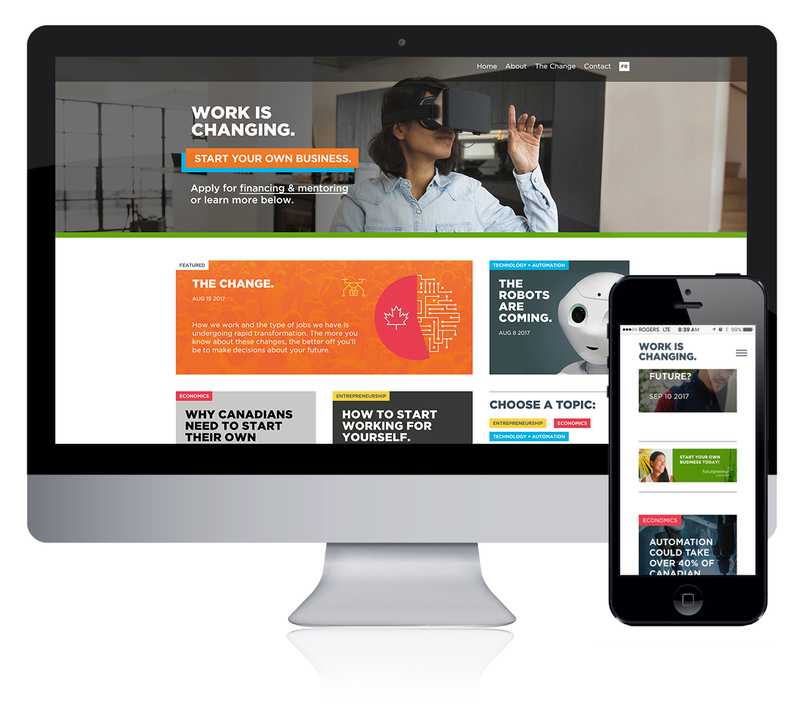 We designed and developed a comprehensive resource hub to house all content created around “Work is Changing” and its narrative themes. Once campaign materials were finalized by Futurpreneur Canada, we formalized campaign standards for future implementation. 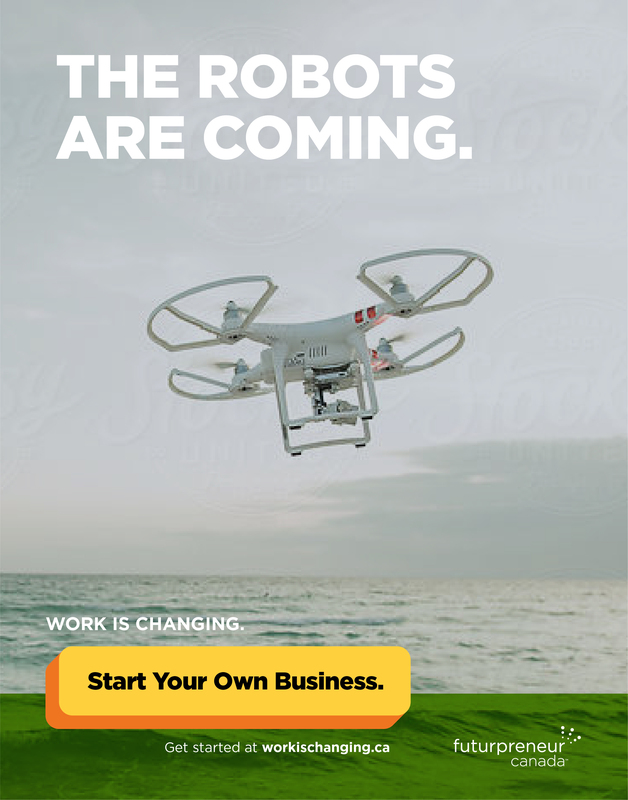 Following a comprehensive content strategy, we created an anchor content piece on Workischanging.ca to outline “Work is Changing”, its purpose and its relevance to readers. We invested heavily to make sure that this piece would be relevant all year, highly shareable online and visually compelling. “The Change” was designed to be a core promotional asset for Futurpreneur across social channels and other paid initiatives. The content demonstrated how work has changed in the past, why the new economic shift is different and how the changes are affecting young Canadians. Through storytelling and an approachable, informative tone, we wanted to better prepare young people across Canada and empower them to evaluate all the facts when making decisions about their careers. Part of our strategy was to communicate how not all change is bad. 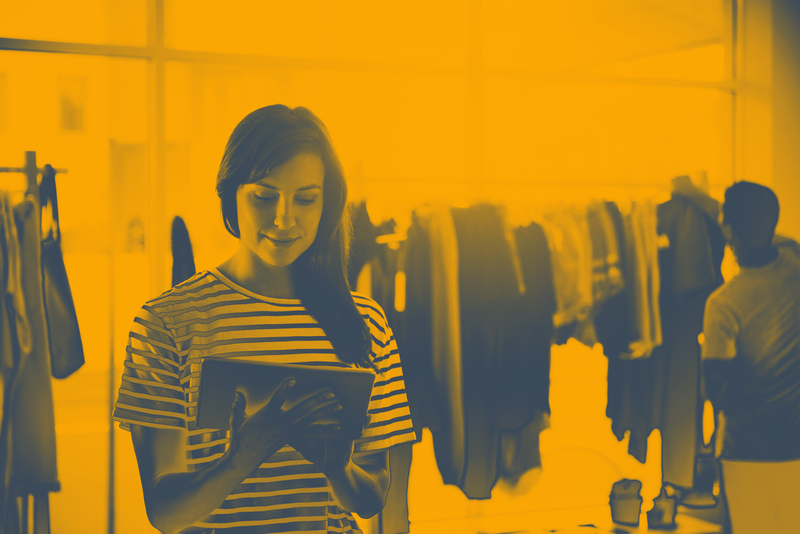 Entrepreneurs and small business owners are empowered by technology that can help them scale at a lower cost than ever before. We knew it was important to demonstrate the significant opportunity for young people who are starting their own businesses. Early in our research, we found that most people leading the conversation around work were journalists with institutions like Vice or the CBC. Our content strategy focused on providing a variety of insights and opinions on current events related to our campaign. 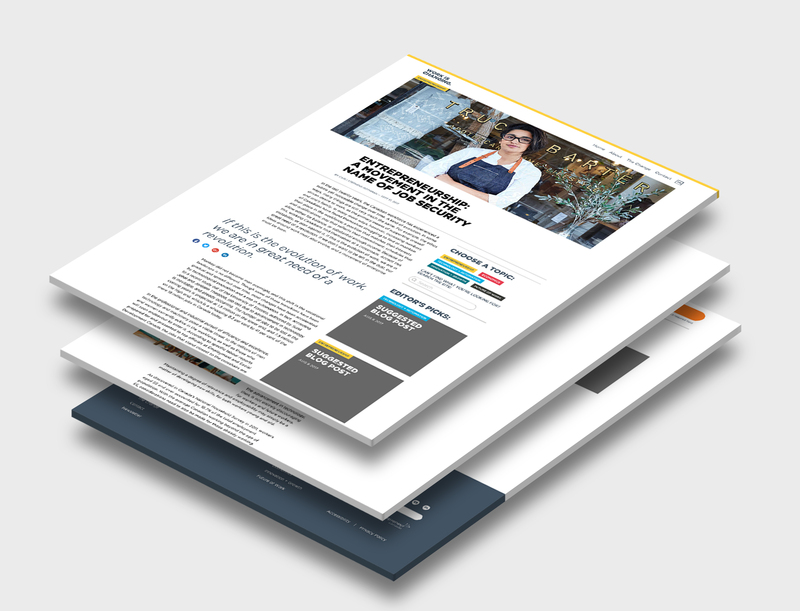 Our strategy was to provide high-quality journalistic content, and create a structure for how different kinds of content would live on workischanging.ca. These pieces are longer in length and explore our themes outlined in depth. Their core purpose is to educate visitors and introduce them to the specifics and nuances within each theme. Each of these pieces was also designed for visibility. Our curated content pieces are focused on timely and responsive trends in the media relevant to each of our narrative themes. Following the launch of the hub, our goal was to provide enough content and structure working with Futurpreneur that this content would eventually become the responsibility of Futurpreneur Canada. The objective of our conversion oriented content was to present Entrepreneurship as a strong alternative for the trends explored within the “Work is Changing” platform. This content is designed to link directly to Futurpreneur’s calls-to-action, such as loan applications, business planning tools, Futurpreneur resources, etc. Our content strategy was designed to move visitors through the website, educate them on how work is changing and illustrate how entrepreneurship can be a viable answer to that change. Each of our five narrative themes influenced how we categorized content. We created five categories; economics, technology + automation, innovation + growth, future of work and entrepreneurship. We sourced writers and curated over 15 content pieces in order to launch the hub with a full suite of content. These content pieces were developed looking at relevant search terms and trending social topics. At Brandish, whenever we develop a concept, we ensure that it serves a larger strategic purpose for our client. 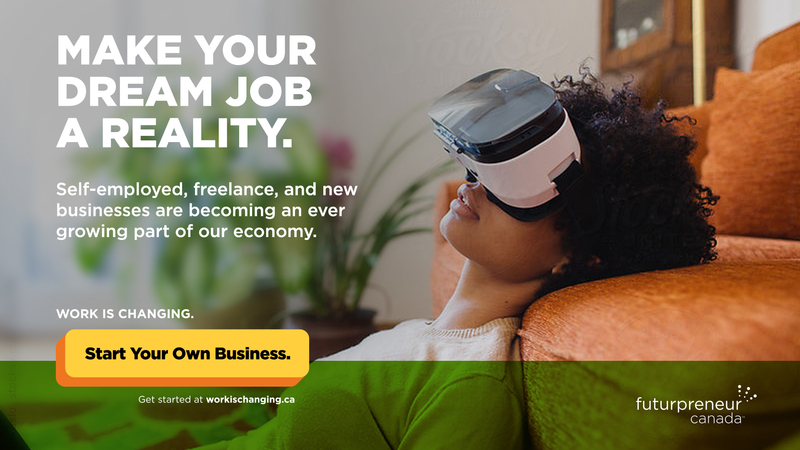 Workischanging.ca was created to educate audiences that require greater economic context, but it was also created in equal part to be an equitable asset for Futurpreneur Canada. With the larger objective of raising awareness for Futurpreneur Canada’s mandate across the country, Workischanging.ca and its accompanying content would form a foundation for future campaigning. We focused initially on content to increase organic search and social visibility around trending topics. Following the completion of Workischanging.ca, we developed an in-depth content strategy for Futurpreneur Canada. Our goal was to empower their internal team to continue building the Work is Changing website. We developed a plan for curated content that outlined our process for sourcing and developing new posts. As an active participant and facilitator to the economic growth of Canada through the creation of entrepreneurs, Futurpreneur gained perspective and context that they can now share with young Canadians looking towards entrepreneurship as a potential future. The “Work is Changing” initiative aims to increase interest in Futurpreneur’s services by drawing attention to the shifting patterns of current and future employment. By highlighting the growing viability of starting your own business as a job alternative, we have positioned Futurpreneur as problem solver and supporter for young Canadians facing a challenging job economy.